So Nintendo sent me a copy of Personal Trainer Cooking earlier this month and I immediately started messing around with it. See, I love to cook. It's one of the few hobbies I have (next to reading and writing) that I find helps me relax. Initially I was just going to review the game, but then I decided it would be fun to video myself using the DS to cook a meal... while drinking... heavily. So maybe it wasn't such a great idea, or maybe I should have read the recipe all the way through before I started to cook a meal for that night. Oh well, live and learn. Enjoy your Thanksgiving (or just a great dinner for those of you out of the country), and think of my aching gut when you take that first bite. 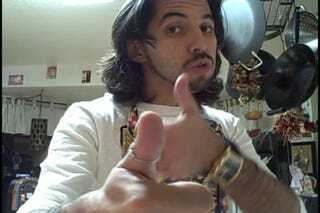 Watch The Brian Crecente Cooking Hour on your iPod or Zune!